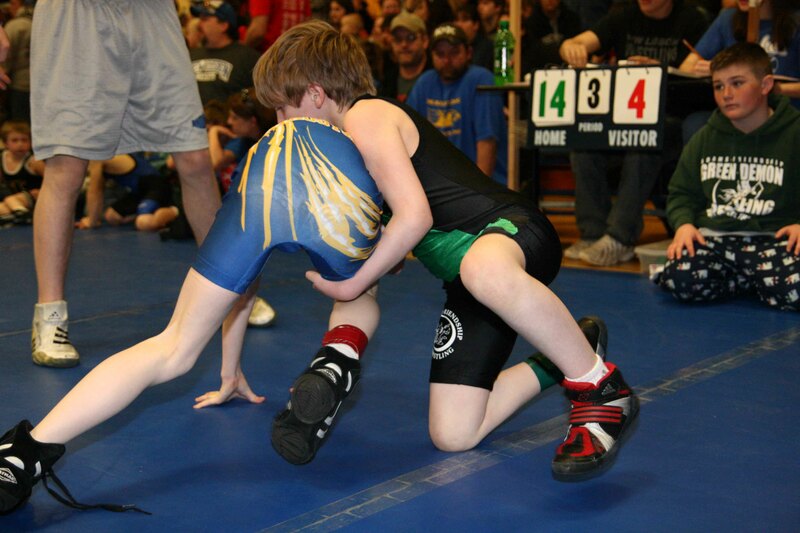 Continuing the pursuit of mat time and practice, and while seeking challenges to prepare for regionals, the Green Demons visited the New Lisbon Youth Wrestling tournament on Saturday, and Marshfield on Sunday. The New Lisbon tournament provided a new experience for the Green Demon youth, offering them the opportunity to watch and learn from a few of our high school wrestlers at the same tournament, including former Green Demons Tyler Burrows and Trevor McManus, as well as wrestler Tyler Schultz. Griffin West took some hard hits in New Lisbon, but little did most of the crowd know that Griffin was wrestling up both by weight class and grade to challenge himself to the toughest competition possible on the weekend before regionals – a solid testament to his character, drive and dedication. Once again, the Demons fell short of a team trophy but as individuals, reflected an outstanding showing of remarkable improvement. Connor Thomas, a first year wrestler, provided an exceptional display in all three rounds, pinning his first two opponents of the day, and falling just short of the coveted first place by a slight loss in the 3rd round. Sebastian Billington, Rylan Burrows and Nicholas Prasalowicz each contributed a 1st place to the team in New Lisbon, with Isaac Salinas, Makinlea Gast and Josh Wallner scoring 2nd place for the day. Brandon and Justyn Kniprath and Gavin Glass each took 3rd place, and despite their grand efforts, Garrett Gasienica and Griffin West ultimately finishing with 4th. Makinlea Gast, being one of the only remaining girls on the Demon roster, has shown impressive and consistent improvement in technique, skill, and endurance in every match she wrestles, proving that she is letting the wrestling world know she is a force to be reckoned with. While the trophy place Makinlea brings home does not always reflect the effort and determination she brings to the mat, Makinlea has grown to become an outstanding addition to the Demon team and a positive example for all beginner wrestlers – regardless of age. On Saturday Makinlea tech-falled a male wrestler 15-0 and on Sunday in Marshfield, she defeated her first opponent that in the past has pinned her, with a winning score of 11-0. Makinlea’s attitude and sportsmanship is a positive example for all, particularly for a wrestler starting out in 6th grade and repeatedly facing opponents that often have many years experience over her. In Marshfield, Christafer Humphrey won his first match ever. 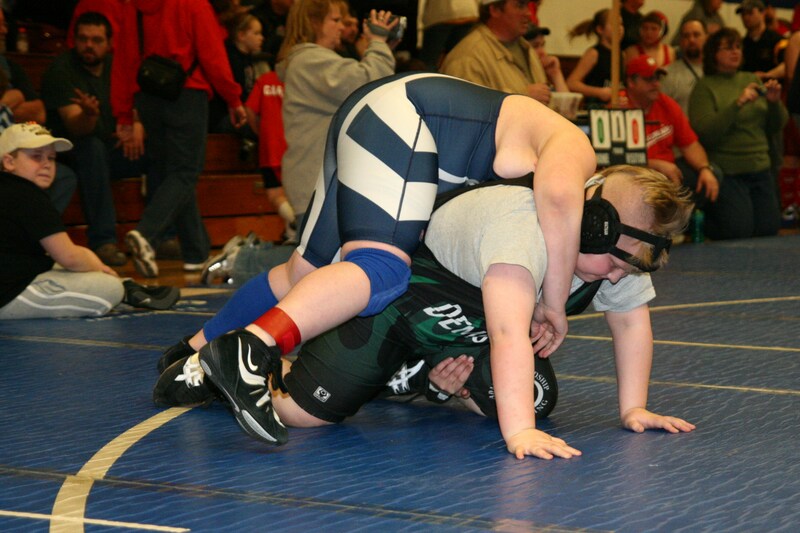 Once again, Chris is a new wrestler coming in to the game as a 5th grader, so his opponents are often more experienced wrestlers. Chris too, always handles this fact with a positive attitude and solid display of improvement. Also in Marshfield, Rylan Burrows demonstrated a show stopping 1st place win in a 5 man bracket against some solid competition, and winning an extra award for the Most Pins in the Fastest Time for his mat……with 3 pins in 3 minutes and 40 seconds. Also pulling out a 1st place was Justyn Kniprath, finishing overall with one pin and two wins, including an exciting 3rd round overtime period. Many members of the Green Demons will compete this weekend in Folkstyle Youth Regionals held at a variety of locations across the state. Only 1st and 2nd place Regional Winners from each location will advance to the state tournament. Wish them luck as they each pursue a spot for State, which will be held on March 27th at the Alliant Center in Madison. GO GREEN DEMONS!